It's hard not to fall in love with anything Christina Henry writes. The Mermaid tells the story of Amelia, a young mermaid who lives as a human after falling in love with a fisherman of a small village. When the ambitious and insatiable P.T. Barnum decides to find a mermaid for his new exhibition and tales of Amelia reach his ears, he convinces her to become part of his show. 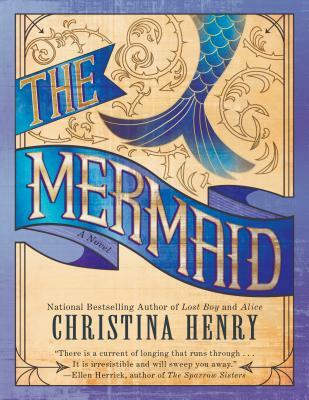 But Amelia begins to question whether or not she can ever leave and soon learns she must fight for her independence and agency as both mermaid and woman. Written with fairy tale-like narration and enchanting characterization, The Mermaid is a poignant portrayal of love and freedom. Amelia agrees to play the mermaid for Barnum and walk among men in their world, believing she can leave anytime she likes. But Barnum has never given up a money-making scheme in his life, and he's determined to hold on to his mermaid. Christina Henry is the author of Lost Boy, Alice, Red Queen, and the national bestselling Black Wings series featuring Agent of Death Madeline Black and her popcorn-loving gargoyle, Beezle.